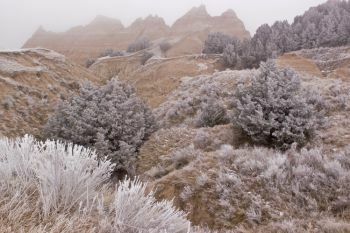 January is the coldest month in the Badlands. The average low temperature is 11 degrees and the average high is 34 degrees. 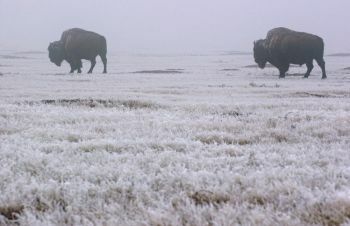 Bison thrive in the Badlands, thanks to a reintroduction program. A million people visit the Badlands each year, but very few visit during the coldest months. The National Parks Service recommends dressing in layers, closely monitoring the weather and letting a friend know your travel plans. "There are so many unique places to go off the road system of the park," Johnson says. 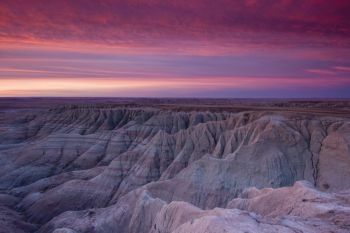 The National Park Service created 10 hiking trails through the Badlands, ranging from a quarter of a mile to 10 miles. 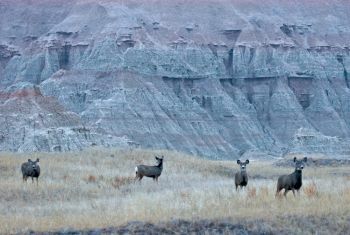 Mule deer, coyotes, bighorn sheep, rattlesnakes, prairie dogs and black footed ferrets call the Badlands home. The Badlands are a solitary destination even in temperate seasons, but frigid temperatures ensure more privacy. 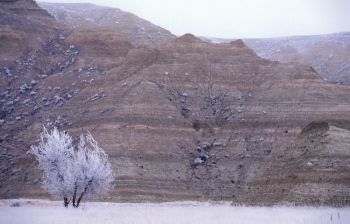 Photographer Carl Johnson likes the Badlands for its seclusion, in summer or winter. Johnson has explored the Badlands since he was a kid living in Rapid City. Now a professional photographer in Anchorage, Alaska, he still comes home to photograph and explore the unique landscape. His fascination with the Badlands grew from his early interest in paleontology and mineralogy. He searched canyons and gullies throughout the Black Hills for rocks and fossils. At age 10 he showed some of his finds to the professors at the South Dakota School of Mines and Technology. Johnson’s forays in the Badlands, and other favorite haunts like Black Elk Peak and Grizzly Bear Creek fostered a love for wild places. Photography came, unexpectedly, when he joined the Navy after high school. He began working as a photojournalist while serving as ship’s photographer for the U.S.S. Haleakala and U.S.S. David R. Ray, photographing everything from re-enlistment ceremonies to missile firings. He continued taking photos while attending the University of Minnesota. A stint working at the Boundary Waters in northern Minnesota got him interested nature photography. When searching for Badlands wildlife Johnson doesn’t just capture an image, but tries to understand and picture the animal in the place where it lives. “You see things more holistically when you combine that understanding with a photographic vision,” he says. Johnson recently married an Anchorage native, Michelle. His family has left South Dakota, but he still returns home to the Badlands. “There is something wild and open and inviting there,” he says. Editor’s Note: This story is revised from the January/February 2009 issue of South Dakota Magazine. To order a copy or to subscribe, call (800) 456-5117.